Lessons and Lesions is a cavalcade of heavy drum grooves, loud choruses and a vigorous mix of hard screaming and melodic singing. Churning guitar riffs and dirty bass support the mood behind Adjacent To Nothing’s second release. Turn the lights down, the volume up, throw this guy into the disc player and prepare for heavy distortion, riffs made of metal, and just generally head banging goodness. 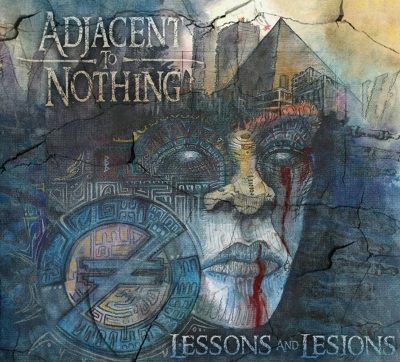 I was initially a little skeptical, thinking that Lessons and Lesions would be a little too heavy for my taste, but Adjacent To Nothing keeps their rhythms solid and throw in some serious progressive licks that make this an estimable album. Lessons and Lesions is an album that demands a lot of volume. I strongly recommend wearing headphones when you tune in to Adjacent To Nothing—the band has an intensity that can sound a little muddy if your speakers can’t separate lower frequencies. The drum beats are crisp, and an effective use of double bass drumming glue the band together as heavy distortion and rhythmic bass lines chug along. Most of the songs on Lessons and Lesions are pretty similar, but if you’re into prog, hard rock or heavy metal, there’s not much to complain about. Adjacent To Nothing use their lyrics as an opportunity to speak out against things that upset them. Take “Jolene,” for example, which you can find on YouTube alongside a well-produced music video. “… Jolene, I’m begging please don’t take my little man,” sings Mike Shumway as the band screams out their anger over using children as leverage in divorce. In “Ralphy Boy,” the band lets out their fury in a high octane fistfight between guitar and bass, “This is going to hurt some, you can’t say you don’t deserve the pain…” Shumway screams out between head-banging verses.